For applications like lifting where additional cylinder stability is required. 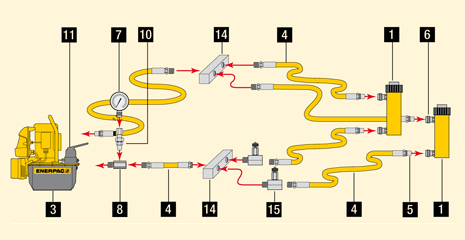 For quick connection of the hose to system components. 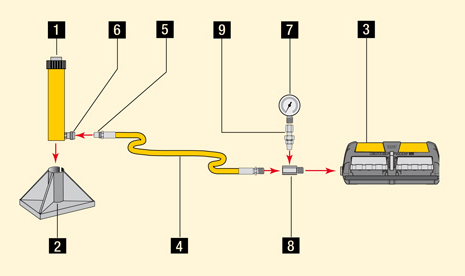 For quick connection of the hose end to the system components. To monitor pressure of the hydraulic circuit. For quick and easy gauge installation. Allows proper alignment of valves and/or gauges. Used when units being connected cannot be rotated. Used to protect gauge from damage due to sudden pressure pulses in the system. Needs no adjustment and allows correct positioning of gauge, prior to tightening. Controls the direction of hydraulic fluid in a double-acting system. Controls the direction of hydraulic fluid in a single-acting system. Controls load descent in lifting applications. Allows distribution of hydraulic fluid from one power source to several cylinders. 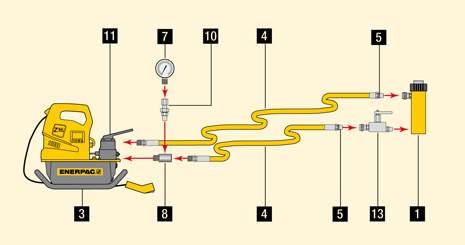 Regulates the flow of hydraulic fluid to or from the cylinders. Single-acting push application, such as in a press. The hand pump offers controlled cylinder advance, but may require many hand pump strokes in longer stroke applications when the cylinder capacity is 25 ton or above. Single-acting cylinder with longer stroke used for lifting applications. Double-acting cylinder set-up used for lifting applications where a slow controlled descent of the load must be maintained. Double-acting cylinder set-up used in a push/pull application. Two point lifting set-up using single-acting cylinders. Four point lifting set-up, using single-acting cylinders and directional control valves.